I love when I run across a scene in which the camera records a truth that our minds simply can not believe. Such scenes force you to reassess what is real and how our minds are able to change reality. I find this idea fascinating and have previously written about it on Uwe Steinmueller's Digital Outback Photo. When I first photographed this waterfall, I thought I was just taking a picture of the flowing water. But when I looked at the image on the LCD screen on the back of my camera I was truly surprised at the colors I saw but hadn't recognized in the water. Nonetheless, when I looked carefully at the moving water, there they were! I hadn't seen them because our brains tend to present 'filtered' information to us which is why, for example, a sheet of white paper still looks white to us even when it is next to a brightly colored object. However, when we take a two dimensional photograph of that paper and look at it out of context, our eyes can recognize the color cast on the white sheet. So where is the color coming from in this image? On this particular morning in Zion National Park, the sky was a deep blue which was being reflected in the waterfall. The falls were located right next to a large canyon wall made of the region's famous 'red rock', and it is the light reflecting off of this red rock and striking some areas of the water that imparts the pink coloration. 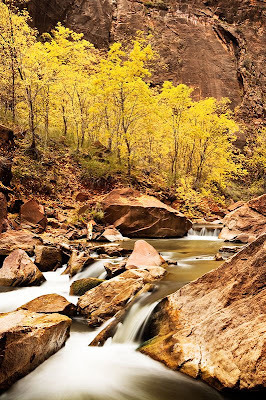 This is another image from the recent workshop that I attended in Zion National Park. 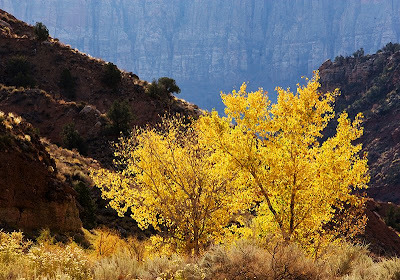 I think this image has, in one shot, many of the characteristics that are so special about Zion.....the cottonwoods, the canyon walls, and the Virgin River. When I look at this photograph I really get a feel of the 'Zion Experience'. The park is truly a place that everyone should get a chance to visit. In addition, this is another of the type of images that I mentioned in my post entitles "Seeing". Though these exact elements are obviously not present where I live, there are very reasonable replacements...trees, water, rocks......all that I need is the right mindset. That mindset, as opposed to a lot of nice images (though it is nice to get them as well), is the most valuable item that can be brought home from any workshop!